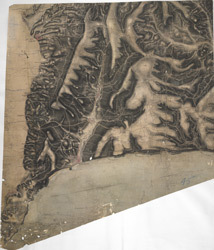 A note at the base of this drawing reads "Ordnance Survey of part of Devonshire". If this annotation was added at the time of the drawing's execution, 1807, it would be the earliest reference to the Ordnance Survey. The word 'flag' on Beacon Hill denotes a trigonometrical station, a location from which the surveyor took angular measurements to plot features of the landscape. Archaeological sites are marked by concentric shapes and dark shading at Sidbury and near Southleigh Hill. It is hard to identify these sites, however, since the dark brushwork used to denote relief renders many place names illegible. The coastline is observed in detail, showing sands, rocky outcrops and coves - a reflection of the importance of accurate surveying along the 'invasion coast'.